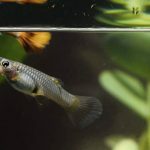 Do my Guppies need a heater for their aquarium tank? Heaters can be rather expensive, so it’s a common question to ask. Usually, the answer is “yes”. It’s a pretty common beginner mistake not knowing that you need a heater for your Guppy aquarium tank. Guppies and other types of fishes rely on the temperature of the water to maintain their body temperature. It’s important to maintaining the proper water temperature is important for the healthy and well being of your Guppies. 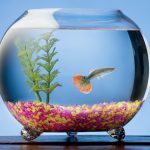 Try to avoid placing your Guppy’s fish tank near a window or door as a cold air might dramatically change the water’s temperature. Guppy’s water temperatures should be in the mid 70s at minimum. Having a heater also helps keep your aquarium temperature within that range constantly. For example, the temperature at night might become cooler than in the day time. The heater will help you keep the aquarium’s temperature consistent, otherwise the water’s temperature might fluctuate drastically. 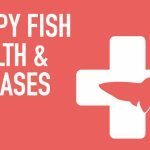 Drastic changes in the water’s temperature are stressful for your fishes and could cause diseases like ich. 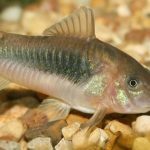 Pregnant female Guppies are especially prone to chilling which might cause an outbreak of ich if their water’s temperature is too cold. 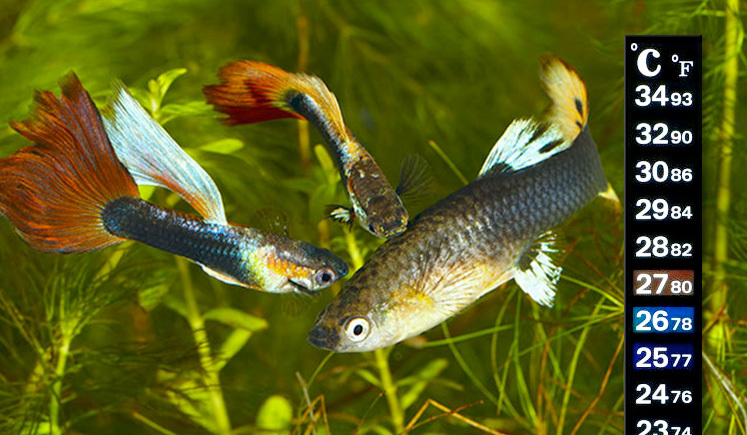 The most ideal water temperature range Guppies is between 50°F – 85°F (10-29°C) . 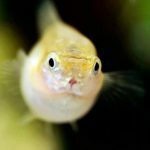 Adult Guppy: the temperature is best set at 74°F (23.3°C). 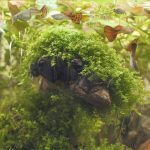 Before purchasing an aquarium heater, it’s important to learn about the pros and cons of the various types so you can purchase the right one. The most suitable types of heater for beginner fish owners are the Immersible and Submersible heaters since they are easy to install and relatively inexpensive options. Hang-on Heaters hangs on the fish tank’s top edge. They usually come with suction cups to hold on to your aquarium’s glass securely so it doesn’t float around in the aquarium. They are probably the most common type of heaters since they are the least expensive type and they usually come with starter aquarium kits or separately available at your local pet store. They typically come in glass tube that houses the heater’s components inside so take special care when handling them. NOTE: If you are consider adding salt to your aquarium then avoid getting Hang-on Heaters as the salt can get into the tube causing corrosion or electrical short. Pro: Lower price makes this heater very appealing to anyone on a limited budget. Con: The heater control must remain above the water line, which is the biggest drawback. Submersible Heaters are fully submersible in your aquarium fish tank. They come in either glass or a durable plastic material. The plastic ones are usually a bit more expensive but might be worth it since the glasses ones could shatter if not properly handled. They’re a lot more versatile than Hang-on Heaters since they can be positioned vertically, horizontally or any angle. Vertical or horizontal position is usually best since it allows the internal thermostat to accurate read the water’s temperature. They usually come with suction cups to hold on to your aquarium’s glass securely so it doesn’t float around in the aquarium. Con: Much pricier than immersible heater. Substrate heaters consist of heating cables or coil that are installed below the substrate. When the heater is activated, the substrate gets radiated to warm the water. Since they keep the substrate warm, it is especially suitable for those who likes to keep live plants with their Guppies. Pro: Heats water more uniformly than immersible or submersible types. Better looking aquarium tank since the heater isn’t visible. Very popular choice for those who keeps live plants since Substrate Heaters promotes plant growth when the plant’s roots are kept warm. Con: Tank must be torn down to install or service them, and they are not very common so they are hard to find. Some of the higher-end filters have built-in heating blocks that heats the water as it passes through. Pro: Better looking aquarium tank since the heater isn’t visible. Another benefit of not being placed inside the aquarium tank is that they cannot be broken by aggressive fish. Con: Usually these filters are really strong and only suitable for larger size tanks. The best location to place a heater is near the aquarium filter’s outlet or inlet. This way, it helps the heated water flow evenly throughout the tank. If you have a tank that is over 40 gallons, consider having two heaters placed at opposite ends of the tank. What wattage should I buy for my Guppy’s aquarium? It’s always a good idea to keep a spare heater around just in case the current one in your aquarium tank fails. These spare heaters don’t have to be expensive models, just a heater that can help provide heat temporarily until you’re able to get a permanent replacement heater. An immersible heater are ideal to keep as a spare heater since they are relatively inexpensive option yet helps provide enough heat to serve as a temporary solution.